Founded in 1912 by Lucian Karolkiewicz, Henry Funeral Service has served the needs of the Polish-American community. During the 1960’s, his son, Henry designed and built the present location specifically as a funeral home across the street from Our Lady of Czestochowa Church, 33 Ward Street, Worcester. Dirsa-Morin Funeral Homes, Inc., and John J. Kazlauskas acquired the firm in 1996, maintaining the long tradition of local ownership. The Morin Funeral Home, founded by the late Omer P. LaChapelle, has been serving the Franco- American community in Worcester in its present location on Grafton Street since 1926. The former LaChapelle Funeral Home was purchased by Adelard G. Morin in 1959. LaChapelle-Morin Funeral Home later evolved into Morin Funeral Home, operated by Mr. Morin until his retirement in 1986. At that time the business was sold to John J. Kazlauskas, then owner of the Dirsa-Kazlauskas Funeral Home on nearby Providence Street, thus creating Dirsa-Morin Funeral Homes, Inc. Funeral and Cremation Service. John J. Kazlauskas, CFSP, another first-generation funeral director, was licensed in the Commonwealth of Massachusetts since 1967. His experience as Past Chairman of the Board of Registration in Funeral Service for the Commonwealth provided him ability to be an aggressive consumer advocate. 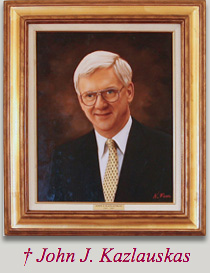 Mr. Kazlauskas served on the Board from 1988 to 2003. He also served as District governor of the International Conference of Funeral Service Examining Boards later becoming the President of the organization. A longtime member and former Director of the Massachusetts Funeral Directors Association, he co-founded the Greater Worcester Funeral Directors Association in 1979. In March of 2005, Jack Kazlauskas succumbed to a long battle with pancreatic cancer. His wife, Barbara Kazmierczak entered the business on a fulltime basis along with longtime colleague J. Brian McSherry to continue the legacy of funeral service on the Vernon and Grafton Hills of Worcester. In 2016, the funeral homes were purchased by Barbara and became known as Worcester Funeral, Inc. Although the names of homes remain the same, the new corporate name identifies with the growth and diversity of our community and the families we serve. Still owned and operated by first generation funeral directors, our commitment to caring and service is paramount to the sensitive work we do. Please click on the links below to learn more about us.